IIEMCA19 will be hosted on the premises of the Mannheim Palace (Schloss Mannheim). The building was erected between 1720 and 1760. It originally served as the winter residence of the Prince-elector of the Electoral Palatinate. With its staggering facade of 440 meters, the Mannheim Palace is the largest baroque palace in Germany and the second largest of the world after Versailles. This impressive look was chosen to illustrate the political power of the Prince-electors. Carl Theodor, reigning from 1742, fostered the arts and sciences and established the baroque palace as a muses’ court. During World War II, the palace was almost completely destroyed. With immense effort and costs it was reconstructed from 1947 to 2007. 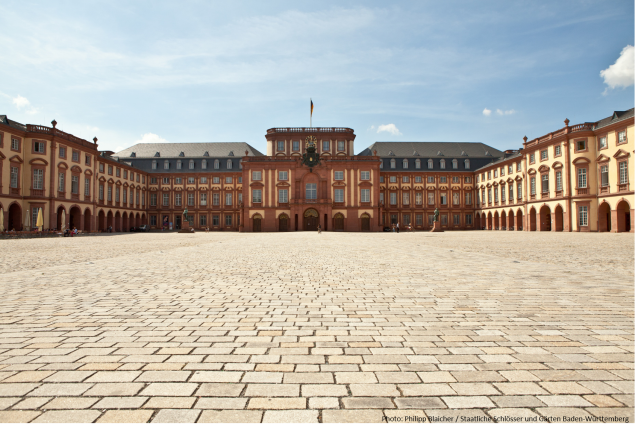 Today, Mannheim Palace is used as campus of the University of Mannheim and its 12.000 students and 1.400 staff members. The university is particularly renowned for its social and economic science departments, but the Humanities are also highly ranked among German universities.